Mirrors are no longer just a simple object where you can see your reflection. It has become a work of art that brightens up the walls and makes hallways more attractive. The objects are now decorative modern wall mirrors. Antonello mirrors have the perfect balance of beautiful design and practical function. There are sleek designs, elegant products and exquisite items—the mirrors have a wide range of designs that could best fit your personality. 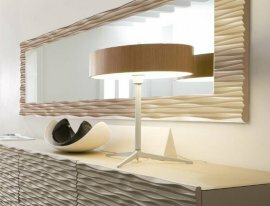 Antonello Italia makes furniture that are well designed and durable.